I am so happy to announce the winner of the CSN garden sign giveaway! I wish I could have had enough signs to give one to everyone who participated, but sadly there is just one up on the block this week. If you would like to purchase a sign like the one in the photo above...or one with a different saying...click the links posted today...and have a blast! I could not post photos of the papers in the bowl...or my two lovely assistants making the draw...as I have had some technical difficulties of epic proportions today...but fortunately I am able to announce the winner!!! We will NOT discuss the difficulties as it will just make me cranky...and a crabby Tootsie is not a good Tootsie to share such wonderful news! can I get a drum-roll please????? A Hocking Hill's Gardener!!!!!! LONA Baby!!! You won!!! If you have not yet had the opportunity to browse her very pretty blog and see all the wonderful flowers she shares....head over there and say hi...get inspired and have a little visit! 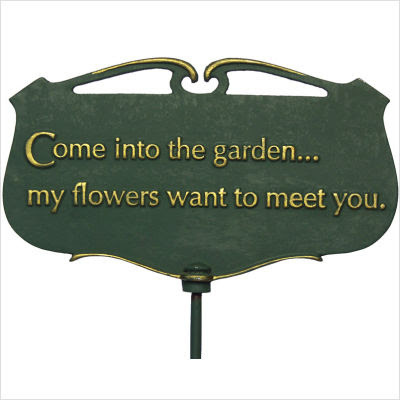 Congratulations Lona...this garden sign will be perfect in your garden! I can't wait to see where you put it! I would like to thank Tyler of CSN Stores for being a great sponsor and for being so generous as to have made such a fun even happen for Tootsie Time! I have enjoyed working with him and visiting his wonderful sites...I see a few dollars being spent in my future over at his stores!!! Thank you again Tyler...I hope to work with you again in the future! If you have not visited the CSN Store...More Mailboxes store....or the Outdoor Lighting and More store...Please do...you won't be disappointed. There's something there for every one! Have a great weekend friends...see you all here again next week! I am still trying desperately to get around to you all who participated in FF and in the draw to comment and spread the Tootsie around...I feel just terrible that I haven't had much time to blog!